I want to start out this review by saying I did not like the plot of this book, and yet it is my first five star read of 2017. The story within the pages of Behind Closed Doors is one of the most disturbing and twisted I've ever read. It is also one of the most well written psychological thrillers I've read. At times this book was incredibly difficult to read, and yet such a page turner at the same time. Told through a dual storyline of past and present, we meet Grace and Jack, a couple who seem to have it all but with a very different life playing out behind closed doors - hence the title. I don't really want to say too much more about the plot as it is the kind best read first hand, however I will say there is a darkness to it that I didn't even imagine when picking up this book. The use of telling the story through both present day and the past adds a element of mystery to the narrative, leading to some very tense reading moments, and I really enjoyed that format. From the narrative, I feel like I was able to get into the mind of Grace the most of all the major characters, however each and every one of them is amazingly crafted. Behind Closed Doors is perfectly plotted, with the last few lines of the book wrapping everything together in the best way - I literally read the last page multiple times because it was just perfect. I debated rating Behind Closed Doors lower than five stars, feeling uncomfortable with the plot, however the book was so well written, held my attention throughout, contained developed character with an amazing ending overall, and because of this I've given five stars. And the fact that Behind Closed Doors is a debut novel, just wow! On Goodreads the author has confirmed that the movie rights have been sold for Behind Closed Doors, and I really hope it translates as well in film format. To be honest though, I don't know if I'd have the stomach to watch the story unfold, it was hard enough reading it. I would recommend Behind Closed Doors to those who enjoy mystery + thriller type reads, however it definitely isn't for the faint hearted. This sounds like a very well crafted mystery/thriller. I didn't used to consider myself faint of heart, but I'm much less interested in reading dark stuff these days. I don't know if it's being a mom now or what, but my stomach isn't quite so strong anymore! I totally understand that feeling, Christine - nowadays I have to break up the dark reads and read a much fewer amount since becoming a parent. You summed up my feelings about this book perfectly!! I felt the same way while reading it - I hated the story and how uncomfortable it made me, but couldn't stop reading. I had initially given it a lower rating, but had to bump it up because the writing is brilliant, despite the fact I didn't like the plot. I'm so glad you found your first 5 star read of the year! Great review, Jade! 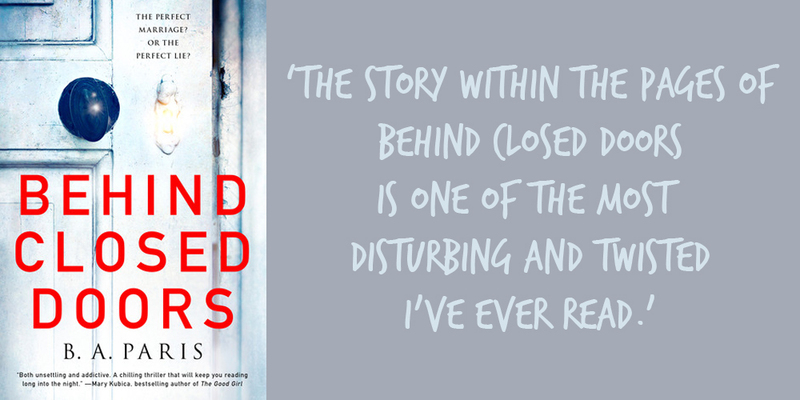 Behind Closed Doors is the kind of book that leaves you so conflicted! Thanks! I probably won't read it because of the dark nature but it's good to know it's so well written. I do love a good psychological thriller. Psychological thrillers make for such good reading - the plots tend to be complex and the they're usually page turners. Having now read this book, I can see why others are avoiding it! Wow. I just added this to the list! I hope you're able to read it some time soon! I don't think I could watch the movie either. ENJOY your week, and thank you for coming by my blog. It seems like we have similar thoughts on this book then. Have a great week, and happy reading!